Yesterday we captured a large boar in the hog trap and the hunter laid him out with a single bullet to the head. 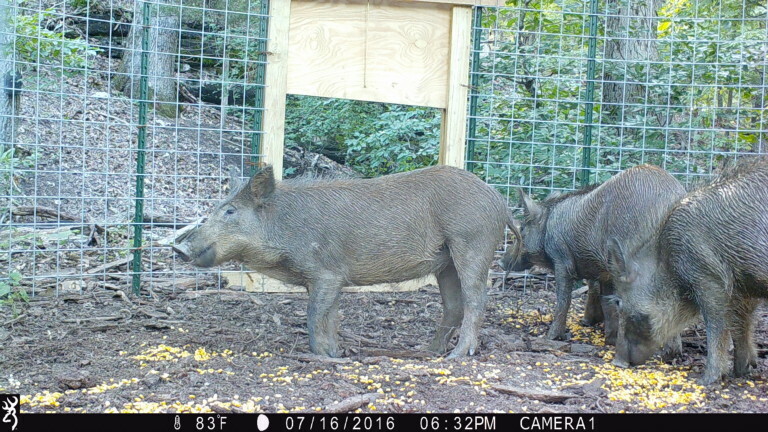 It is not a pleasant thing to consider, but the wild hogs have become an incredibly destructive force in the forests throughout the south.They compete with other wildlife for their food, but they also destroy native habitat. We were alarmed and called to arms when they destroyed the gardens around our home multiple times and the state and local governments refused to act. Today in the Sunday Arkansas Democrat-Gazette the profiles section features an up and coming young woodworker named Matt Buell. It is a pleasure seeing woodworkers of any age being recognized for their work. Matt described his discovery of woodworking as follows: "I spent years running around trying to find what I thought I needed, and all I found was misery and sadness. Sometimes I think the best thing we can do is stop looking." As told in the article, "Buell was thirty when searching for something to keep his hands and mind busy, he picked up an electric guitar and decided to turn it into something it wasn't." His play with that guitar led to other things. Building what he thought would become a guitar shop in an old garage, he got sidetracked into making furniture and never finished the guitar. I keep reading about Donald Trump and all the vicious things he says, and am completely befuddled as to why we would be allowed as a contender for President of the United States. I am particularly troubled by his disparaging remarks with regard to those who have made significant sacrifices in the military. In his latest remarks, he attacked a Muslim man and his wife who had lost their son in Iraq. He compared his own "sacrifices" employing others to build his wealth to that of gold star parents and their son. He is so completely out of touch, and yet many Americans seem to be equally so. This is a particular concern for me. If a man is so out of touch from the sacrifices made by men and women in the armed forces, he will put them needlessly and unnecessarily at risk, while pouring the wealth of our nation and its position of leadership in the world, down the toilet. While I know that some of my readers may be supporters of Donald Trump, I cannot help but say the truth as I see it. Some readers may not like Hillary Clinton, but I think it is time for us to consider the needs of children she has sought to serve rather than the needs of the billionaire class. A second thing that disturbs me greatly is the number of lawsuits he has filed against craftsmen and contractors hired to build his monuments to himself and his greed and the number of times he has reneged on promises to pay fully for their work. Just as he has no shown reasonable consideration for men and women in uniform who have put their lives on the line to protect our nation, he shows no sincere regard for those who have built his wealth. He has been described as a short-fingered vulgarian by those who have known him well. Can there be a relationship between his hands and his obvious defects of character and mind? His life illustrates the dangers faced by society when wealthy children are left out of touch. So, if I have offended any of my readers, I offer no apology for what I know to be the truth. open house at Clear Spring School. We have an open house today at the Clear Spring School, from 11 AM to 3 PM. Visitors are welcome. I know that most of my readers are from far away. But come see the school and the CSS woodshop if you can. I'll be there to to tell about the Wisdom of the Hands program and to introduce the philosophy of hands-on learning. 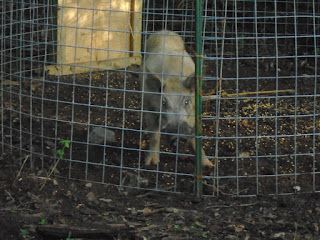 Today we have a very large boar in the feral hog trap. It has tusks about 1 1/2 in. long, and you would not want to encounter it on a stroll through the woods. As I've mentioned, feral hogs have become a danger to the forests of Arkansas and must be reduced in number or eliminated. We are beginning to make some small progress in that nearly a dozen have been removed so far within shouting distance from my home in the forest. I have settled on dates for my classes this next summer at the Marc Adams School of Woodworking. I will teach my usual 5 day class on box making followed a one day class on making Froebel's Gifts. My classes at Marc Adams School fill quickly so sign up for their newsletter or watch their website in November for the earliest possible date for your registration. At this point it seems I've made enough guitars for awhile. I'll be adding frets to one more in addition to the one I fretted yesterday as shown in the photo above. The others will need to be finished or painted, and have bridges, nuts, tuners and strings added. Most of my readers these days appear to be in either Russia or Germany, and the favorite post being shared between readers in Germany concerns the peak of mount stupid, a blog post I wrote December 29, 2015. Read it. It might help to explain a few things. Yesterday I made a 20 minute presentation to our local Rotary club on the Clear Spring School. One of the questions raised by one of the members in the audience was that of why our small town of Eureka Springs would have three different school system, public, the Academy of Excellence (a bible based school) and Clear Spring School. I'm concerned that I did not answer the question as clearly as I would have liked. But while the public school is constrained by the neck as they try to conform to state standards, and as the Academy of Excellence places its strongest focus on imparting a particular bible based frame of learning reference point, Clear Spring School is focused on the interests of the child. I am better at writing about all this than talking about education, in large part because when I write I take a narrow focus on things whereas when I speak to an audience, I am filled over with the huge amount of information at my finger tips, and I feel a sense of urgency, as though if I haven't gotten my point across, I will have wasted my brief opportunity to engage. One of the things to be noted about Clear Spring School is that our community is actually considered too small to support a school like it. And so Pat Bassett, head of the National Association of Independent Schools called CSS the "miracle in the woods." It is a miracle that the school exists, and a miracle that we managed to hold on during the great recession when many larger schools either failed or were forced to merge. So why Clear Spring School, and why is it important, and why would so many folks in the community continue to support it? It offers education that is in harmony with the way children (and adults) best learn. That would be the one thing that I would have said in simple terms if I could go back and start my 20 minutes over again. Today in the wood shop, I continue work on box guitars. According to tracking software this blog has developed a large attendance lately from Russia for reasons I may not understand. From Germany lots of folks at going to this page: The peak of mount stupid. Perhaps German readers are trying to learn why Americans can support the Republican presidential candidate, a man who has proven himself to be selfish and immoral. A couple days ago, the Diane Rehm show featured a discussion of digital media addiction, and the long term developmental problems warned about by the American Academy of Pediatricians and others. It seems that the experts know a great deal about the dangers, but that American parents and teachers are often too addicted themselves to see the dangers. We think we are manipulating our devices and assume we are intelligent in some way for having done so. In reality, we are being manipulated. Bruner (1966, p. 41), a supporter of varied learning experiences, stated that "...increasing the manipulability of a body of knowledge" creates both a physical and mental optimum learning structure and con- tended that physical operations create feedback of learning that allow children to see it happen. Lipson and Fischer (1983) sustained this reasoning, stating "Experiences without words are difficult to integrate, describe, and retrieve. Yet, words without experience tend to have limited meaning. The two reinforce each other and are defined by one another" (p.254). Martinez (1985) further explains this in saying that a student who is introduced to a concept such as walnut wood will grasp a different meaning than a student who actually uses walnut and experiences its properties firsthand. The point is to explain that even though some may think that hands-on learning is messy and time consuming, its effectiveness more than makes up for its challenges. I am working on a 6 string guitar neck and two more common cigar box guitars, but with boxes I made myself. As you can see, we caught a pig in the trap yesterday. It was about 24 inches high and weighed about 125 lbs. I have started a couple more boxes for guitars and am making a full size neck for a six string. If you can make a 4 string or a 3 string, adding two or three more strings is easy. I am also getting ready for my class at the Eureka Springs School of the Arts in two weeks, and beginning to plan for the coming school year. Readers interested in learning hand-tool woodworking may need to look no further than the turn of the 19th century for all the information required. The Course of Study, Manual Arts Training Department, Chicago Public Schools, 1899-1900, offers a full and useful range of knowledge for teachers as well as for those who would simply like to learn on their own. It provides information on over 100 different species of wood, but also information that many woodworkers no longer know. For example, the various types of teeth on saws, and about saw set, and the like. One of the great things about woodworking is that through it we cultivate both intellect and skill. For those who would like neither, tools are being designed that remove the necessity of both. For instance, Wired magazine this month has a hand held router that adjusts itself for the inexact motions of the operator. Instead of watching your work, you watch the screen on the router as you move it through inexact motions and the router adjusts itself to a perfect cut. I am certain that many woodworkers will be lined up to buy skills that they've not earned through practice and application of mind. For the rest of us, old books from the tail end of the 19th century may suffice. The image above is of the Gamble House in Pasadena. 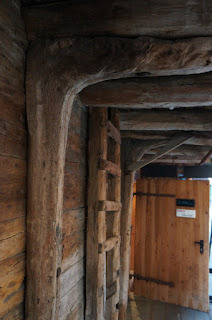 I was there on Saturday to see the lovely woodwork. Interior photos were not allowed, but there are many images to be enjoyed on the web and in books. I am back in Arkansas from L.A. and reflecting on the things we did there other than drive in freeway traffic. It is pleasant indeed to be away from all those cars. Among other things we visited the Gamble House and the Getty Museum. As a woodworker, both were of interest. I also visited the LA Museum of Craft and Folk Art. A few years back a group of members came to Eureka Springs to visit me, and I never knew why. It remains a mystery to me, as the L.A. Museum of Folk Art is a rather small place in the vast L.A. scheme of things. 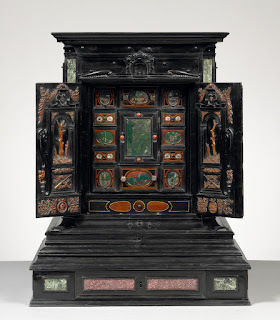 The image above is a "display" cabinet (Kabinettschrank) in the Getty. 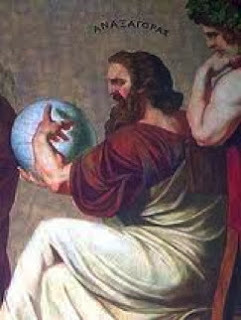 At the time it was made in the 1600's it was proposed to contain what was known of the universe. It opens on all four sides to drawers and doors, each compartment holding some aspect of what was known of science and culture. Give your boys a box of good tools, and if possible a room or place for a workshop. Employed in it, they will not only be kept out of mischief, but they will be strengthening their muscles, exercising their mental powers, and fitting themselves for greater usefulness, when they shall be called upon to take their places in the ranks of men. The cabinet shown above, might be called a curio cabinet, as it contained objects of curiosity. But to make children even more curious, give them real tools instead. The following is from Bayard T. Putnam's article in July, 1895, "Century." "I wish to present a plea for a 'tool house' at home for the young people, and one well stocked with the best tools. A great deal of creditable work has doubtless been done with a jack-knife and an old cross-cut saw, reinforced, possibly, with a half-worn- out smoothing plane, a rusty bit or two, and, perhaps, a chisel; and a certain amount of ingenuity has unquestionably been developed by the adaptation of these tools to the work in hand. But, after all, the best that can usually be said of such work is that it is very well done considering the means. The edges are rarely square and true, the joints are rarely well made, and the time consumed on the "job" is apt to be unduly prolonged, so that the work, if intended for something more than a mere makeshift, becomes wearisome before it is completed. A necessary consequence is that the boy (or girl, for there is no reason why a girl should be ignorant of the use of tools) becomes discouraged with his work, and decides that his forte is in some other direction. If on the other hand, a boy once becomes familiar with the use of good tools — tools such as an artisan would use for the same work — the knowledge stands by him, and is a source of constant pleasure and often of some profit. In a few words, to use a Western expression, the best tools ought not to be 'too rich for the blood' of any intelligent American boy." Along with the best tools must be supplied some knowledge in their care, and safe use. You may play a part in that if you choose to do so. Skill in the use of tools is of incalculable advantage. It gives useful employment to many an otherwise idle hour. It prompts one to add a thousand little conveniences to the house, which, but for this skill would never be made. In a word, it is carrying out, in a fuller sense, the design of the Creator, when he implanted the faculty of constructiveness within us. A bent for mechanical pursuits usually manifests itself at a very early period in life; the inclination of the six-year-old boy to hammer and pound, to tear open toys and clocks to 'see what makes 'em go,' all so annoying to the careful parent, may be taken as indications of latent constructive genius, although now manifested in a very destructive form. In the youth the mechanical bias becomes still more apparent, manifesting itself in attempts to construct wagons, boats, small engines, etc. With such a boy a mechanical education is no doubtful experiment. Give your boys a box of good tools, and if possible a room or place for a workshop. Employed in it, they will not only be kept out of mischief, but they will be strengthening their muscles, exercising their mental powers, and fitting themselves for greater usefulness, when they shall be called upon to take their places in the ranks of men. I am still in L.A. and must wonder how many children in this very large place get the kind of education they most need, and that fits best their natural inclinations. Make, fix, create, and offer to others the love of learning likewise. No character in American history who had not served as president of the US had greater effect on life and on politics than Ben Franklin. 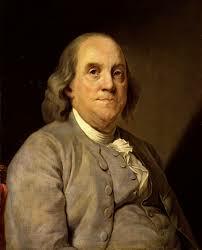 He was an inventor, an author, and scientist whose writings had led to the founding of the University of Pennsylvania. When he was a young man, he was always busy trying to make things while at the same time as described by Zacharia, "philosophizing and imagining in the abstract." He wrote a pamphlet describing the ideal system of university education that can be found here: Proposals relating to the education of youth in Pensilvania. It is worth considering if we were to ever reimagine what education should become if we were to scrap the stiff, self-conscious, unnatural and overly expensive system we have now. I am still in L.A. and enjoying a brief family reunion. We plan to go to the Getty Museum today. I am in Los Angeles for a family reunion and away from my wood shop. I have been reading Fareed Zacharia's new book In Defense of a Liberal Education, and nearly finished it on my 3 1/2 hour flight from Arkansas. The book starts out telling a bit about his own life and then a bit about how our universities became what they are. Then he explores jut a bit of what universities may be destined to become. I received this book from a student at MASW who said that it was a good book except for the fact that Zacharia said too little about the hands. About that I agree. My wife reminded me that in her last trip to New York she and my daughter had seen Fareed Zacharia in Metro Diner on the upper west side. In response to reading Zacharia's book, I am attempting to conceptualize what an ideal university might be like. It would be much more like a think tank except that the participants would have real things to think about. They (professors and students) would be making beautiful and useful things within it. As they worked under the tutelage of expert philosopher/craftsmen to create objects of lasting beauty, students would discuss life and philosophy, the materiality of the substances (sciences) they transformed, and reflect upon and write about what they had done and how their ideas and ideals connect and shape community, human culture and the world at large..
Just like the colleges that gave universities their starting points, they would be small and their work would be intense. 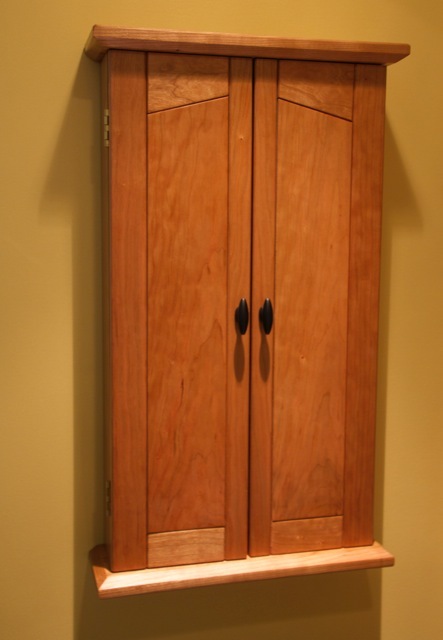 One of the students, Don, from my MASW cabinet making class finished his small cabinet, and fitted the inside for use with jewelry. He had opted to leave the shelves out and design the interior to his wife's specifications. He says it was helpful to be able to finish the cabinet at home and to have his wife's input on the interior design. Is that not always the case? We are smarter and make better decisions when we collaborate with others. I am impressed with his work. 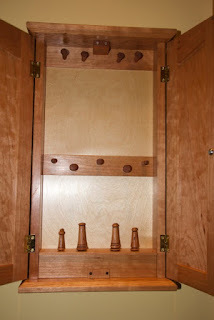 I am hoping that many of the other cabinets made by my students will be equally lovely. Don included a secret compartment in his and used it to display some of his skills on the lathe, by making turned pegs and ring holders. 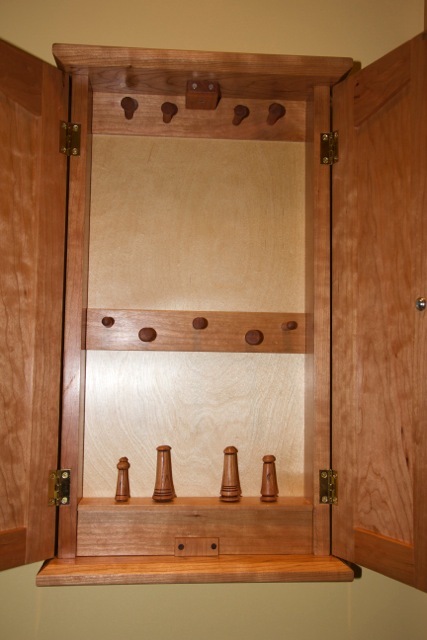 The cabinet (without Don's additions) is one featured in my book, Building Small Cabinets. Editorial review and corrections are now completed for my Tiny Boxes book and it is ready to move along to its next stage in production. One of my students at MASW gave me a copy of Fareed Zakaria's book, In Defense of a Liberal Education. (Thanks, Andy!) One of the many points it makes is that trying to educate young people to fit careers is not enough. They need to be brought up into the broad expanse of human culture, becoming engaged in an understanding of history, and literature. Who can argue with that? I for one, would never do that. But to focus on intellectualism alone as "liberal education" is not enough. The hands must also be included in the making of useful beauty as a grounding for all else. The illusion of a successful economy is what happens when you have an intellectual elite that has been groomed and cultivated to be out of touch with the working class as described by Woodrow Wilson in 1909 when he was president of Princeton. The same can be said of a man of labor. His work may be an expression of intellectual engagement and a flowering of human culture, just as might be that of the academic. The most fruitful flowering is when both sides are expressed in and through each other. I feel like writing Zakaria and asking him if he understands the value of the manual arts. Educational Sloyd was at one time considered an important part of a liberal education. Make, fix, create, and extend to others the courage to learn likewise. During my summer break from Clear Spring School, I continue to work on guitars and made the tiny boxes shown above for gifts for nieces from my Tiny Boxes Book. These tiny tiner are made with elm sides and have lids made from spalted sycamore and pecan. A Danish oil finish shown below brings the colors of the woods to life. I am also beginning to plan for my veneered box class at ESSA in August. This afternoon, I meet with the architect designing the new wood shop for the Eureka Springs School of the Arts. When I hastily split and stacked firewood a few weeks ago, the stack toppled over reminding me that one must not work in haste. My wife had wanted me to get the work done quickly so we rented a log splitter and I asked a friend to help. 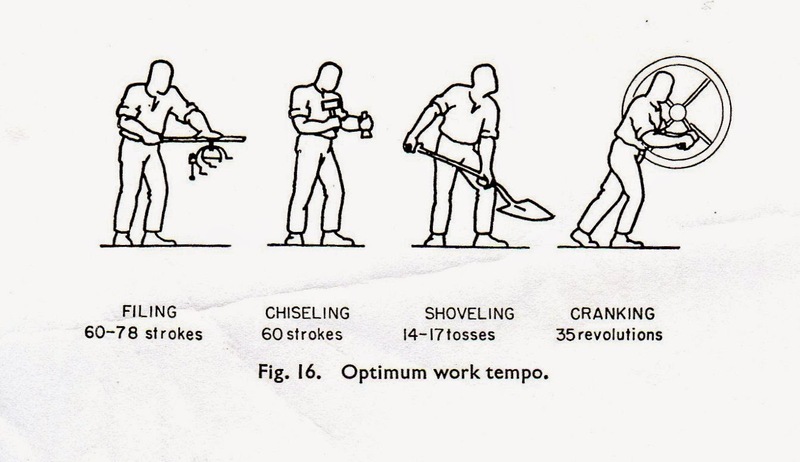 Machinery can drive you to its own rhythm, and often lacks the tempo of a simpler life. So the toppling of the wood stack gave me the opportunity reverse course and to try the Norwegian round stack method as shown in Lars Mytting's book, Norwegian Wood. My stack is just a bit taller than I am and about 6 foot in diameter. There are some advantages. The first is that having no end to the stack, no elaborate means of cross stacking is required to hold pieces of wood in place. Secondly, it can be built to close at the top and shed water (or snow) as it forms its own roof where it closes at the top. 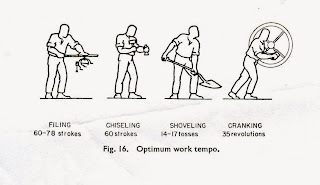 Another advantage of work without machinery is that it moves at a more human pace, as illustrated by Drillis in Folknorms and Biomechanics. There are some disadvantages in using hickory and oak to build a Norwegian round stack. The oak and hickory from Arkansas are much less uniform than the woods commonly used in Norway to build such stacks. Artistically, however, the round stack might resemble to some, the beautiful sculptures created by Andy Goldsworthy. It will not be an embarrassment to have this standing in our woodlot. 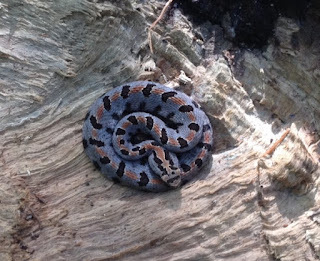 Discovery of a tiny timber rattler nesting among the toppled stack was one of my rewards for rebuilding. When I disturbed him, by gently dumping him off the log, he slithered off into the newly finished round stack. This one particular boar, taken close up from the game camera at knee height shows what we've been up against. He would weigh in at over 300 lbs. and if you can imagine this character and his friends roto-tilling through your front yard, you can get a sense of what we've been up against. We've have to give up on the gardens around our home until these destructive hogs can be brought under control. Unfortunately the only way to do that has required building and maintaining a trap where they will be lured to their death. 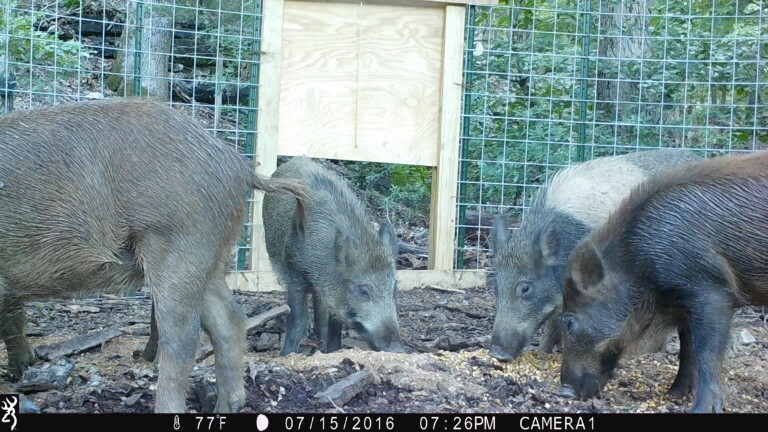 Feral hogs were a part of Arkansas heritage, even though hogs were an introduced species. Called "razorbacks", early Arkansas pioneers would let them run wild and then hunt them down for meat during the fall and winter months when it was safe to process and eat their meat. They were first introduced to the state of Arkansas by the Hernando De Soto Expedition in 1540 and the diseases they carried had a tragic effect on the native American population. They were hunted nearly to extinction, and then reintroduced by hunters in the last few years. They reproduce at such a rate that 70-80 percent must be hunted or trapped and killed each year to maintain a status quo. The damage to our gardens has been devastating in a most personal sense. Carefully laid stone borders that my wife and I built and maintained for over 30 years have been shoveled aside and thrown askew several times by these fearsome wild creatures. But perhaps what's even worse is the damage they are doing in the forest. They are destroying other wildlife, preying upon our wild turkey population and their rooting in forest soil puts all of our mushroom species at risk. When people walk through or stay overnight in forests, they often exhibit changes in the blood that are associated with protection against cancer, better immunity and lower blood pressure. Recent students have also linked nature to symptom relief for health issues like heart disease, depression, cancer anxiety and attention disorders. Another development in the news has to do with an altered reality game, Pokemon Go. It has been claimed to have all kinds of health benefits because it lures kids and adults to play outside. As an example, I watched on Friday as a young man in a Walmart parking lot followed his cell phone screen across the lot completely oblivious to the real world around him. And in the news, there's the story of young men playing Pokemon Go in California. Led by their screens they fell off a cliff. I would note for those who have missed the point, that there is a real world that surrounds us. Make, fix, create, and offer others the hope of learning likewise. We have finally gotten pigs comfortable with the trap, and by treating the corn with diesel fuel the deer avoid it. The pigs will, as they say, eat anything. 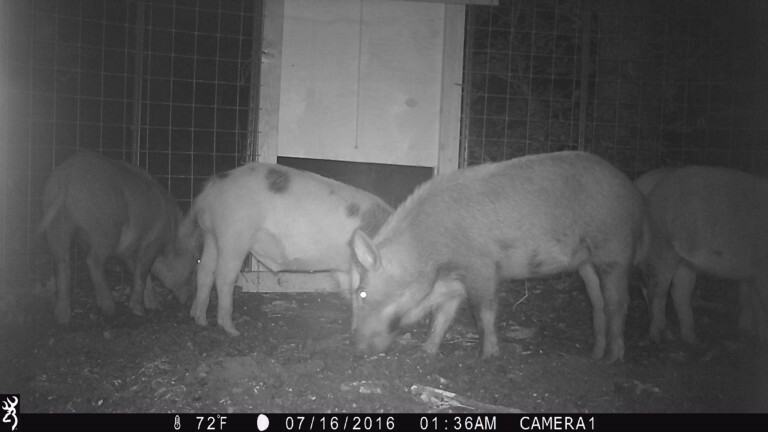 From about 7:30 PM until after 2 AM we had several hogs in the corral trap at the same time. Unfortunately, my hunting partner is out of town for a week, and we will wait until he's back to set the trigger on the trap. We have been horrified by the damage these pigs are doing to the forest and to our gardens, and it feels just right to be taking positive steps toward their elimination. I will continue to put diesel corn in the trap to get them comfortable to enter the trap regularly in large numbers and to be careless. Now I only wish there were folks ready to butcher and eat these critters. I've been told that they carry too many diseases this time of year for them to be of any use. In the aftermath of September 11, 2001 Americans led by the George W. Bush administration, decided to invade Iraq. The rationale they presented for their decision was that Saddam Hussein was building weapons of mass destruction. They went into Iraq with huge forces, used smart bombs to target strategic infrastructure, and disemboweled the Iraqi military, leaving the place in chaos, which then spilled as chaos does, into nearly every nation in the middle east. The French had been reluctant to join what they had known was a military misadventure. And yet last night they were the first to learn that even a large truck can be used by even a minor maniac as a weapon of massive destruction and terror. Back when George W. Bush used American power to begin the systematic destruction of Iraq, I hoped and prayed that he could possibly be right, even though I knew he was not. Throughout the misadventure his administration thought it would be a cakewalk and that the Iraqi people who had suffered for so long would greet us, our troops and our imposition of democracy with genuine warmth. Don't we all wish that could possibly have been the case? It was not. A craftsman can actually know about such things. When we attempt to craft something beautiful and useful from real materials in the real world, we know how many things can go wrong and how much it can take to set things right. We know that to launch a grand scale plan without consideration of the smallest details leads to serial effects. Even Bush's Secretary of State Colin Powell had warned, "you break it, you have to fix it." But nations and whole peoples are larger and far more complex than a tea cup. When you launch whole armies against small nations, no matter how large your coalition, and how self-righteous you feel about the operation and its necessity, there are real effects that can last for generations. What we learned with great sadness last night is that even a thing as innocent as a truck, can be turned toward evil effect, and that the work we must do to make the world safe for our children is far more complex than can be fixed with bombs and drones. In grief and in solidarity with the French people, I hope to remind the entire world of the powers of craftsmanship, and the usefulness of beauty in re-crafting and recreating the lives of people who are strange to us and strangers to us. As you can see in the photos above, I continue to make more guitars. To make beautiful and useful things provides comfort and escape from an overly troubled world. It also moves the world in a less troubled direction. Those who are plotting beauty, and planning usefulness have little time for or interest in destruction. It is a simple formula requiring a simple choice. Make beauty or suffer the societal consequences of not making. Make, fix, create, and encourage others to partake in the joy of learning likewise. Last night my wife and I and friends attended Opera in the Ozarks for a performance of Don Giovanni by Mozart. There were about 15 singers in various roles and a small orchestra of about 10 musicians. The opera director described Opera in the Ozarks as a "pay to play" opera, meaning that the singers and musicians are there either on scholarship, receiving no pay, or have had to pay some portion of their expenses in return for the opportunity to polish their gifts though high level performance. The experience for most of the students involves roughing it. The experience for viewers also involves a bit of roughing it and discomfort. The auditorium last night was hot, and the seats hard, but the object is not money and comfort, but encouraging young singers in a field in which only a few will discover financial success. How can I put this? The most valuable things in life are not those things that come with money. And in some cases money can be more of a deterrent to happiness than the lack of money. If the idea of money is to get more of it, so that it can be accumulated in stacks, we've missed the greater meaning of life. The question, "what is your net worth?" should never be measured only in dollars and cents. I continue to make guitars and am finishing what may be the last two or three in making the book. After the last photos are complete, I'll try to figure out how to move them out into the world to make room for what comes next. To be involved in a creative process is far more valuable than having lots of stuff. When we think of the word economy, we tend to think large and complex. We ought instead think of Thoreau, of Shakers, of parsimony, and of great grandparents who wasted not a single thing. I mention the Shakers in reference not only to thrift but to the quality of design that is reduced to utter simplicity. I mention Thoreau because he suggested a path toward a more meaningful life. Economy of thought can lead to an uncluttered state of mind, allowing us to live more simply, and to reveal and release something greater in ourselves toward building the value of community. Craftsmanship is actually a gift that we give to ourselves, and not just something we give to others. I had an interesting experience at Marc Adams School this year. (As I do every year.) Making tiny boxes with all those small parts, it makes great sense (economy of effort) to work on more than one box at a time if for no other reason than it is safer to work on long parts than on short pieces. This is particularly true when faced with difficult operations. My plan was to have each student make one box with sides formed by a molding cutter. It was also my plan to use the lesson in the use of material to demonstrate an important point of safety. I had enough stock for each student to make one box but the process required each student to team up with another, each student sharing in the milling (which required two steps) and the stock, receiving one end of it after milling for their own box. I carefully explained to the whole group how the process would work, that it required sharing, and that each student must choose a partner with whom to share. In other words, we had 18 students and only 10 pieces of stock, as I allowed for two extra that could become 4 boxes. It appeared that I had everyone's attention and that they had listened attentively as I described the lesson. But when it came to actually doing the work, students came to me, one after another, saying there was not enough stock. Had I really spent the last 5 minutes carefully explaining one of the most basic principles of kindergarten to a group of 17 woodworkers, only a few of whom had actually listened and understood one of the most basic lessons of life? To share? After more than a few students claimed there was not enough stock, we quickly produced more just to avoid making students embarrassed for having forgotten the most basic lesson of kindergarten and of life. One of the very first lessons in kindergarten (and in the home) is the idea of sharing. It is the true basis of economy. You take this end of the board, I'll take the other, and by working together, we'll each get a box. While politicians will blather on and on about "it's the economy, stupid," there are much more important principles of economy than those represented by the economy they are talking about. Economy can refer to thrift in the use of resources, and careful refinement of steps. It offers safer workmanship, and it provides opportunity to establish deeper relationships of trust. I'll not blather on about this today. A word to the wise is sufficient, and there's also economy in that. Yesterday in the wood shop, I continued work on box guitars. Today I may do the same. I have written before about the financial economy, vs. the economy of living and of life. They are two vastly different things that lead us in two vastly different directions. The financial economy might lead you to Walmart to get the best deal, and then march you onward as a consumptive tool in the global financial market. The economy of living and of life, invested with the urge to take control of your own life and that of your community, would lead you to plant things in your garden, do things responsibly for yourself, to get along without, to make, to make do, to share freely with others in your community, and to encourage others to do the same. The following is from June Eyestone's paper, "The Influence of Swedish Sloyd and Its Interpreters on American Art Education." During the early nineteenth century, domestic sloyd in Sweden entailed the making of useful objects for the home, including tools and farm implements, clothing and textiles and utensils. Peasant farm families in Sweden employed sloyd activities to sustain the prosperity of their homes, including education of children. In addition, sloyd objects were sold on the market, thereby providing additional income during the long winter months. Sloyd pieces revealed a regard for simplicity, balanced design, and resourcefulness. Traditional values of practicality and of durability characterized not only sloyd pieces, but also the people who made them. Sloyd was testimony to the peasants' spirit and strength of character which enabled them not only to survive but to thrive under harsh wintry conditions. Toward the latter half of the nineteenth century, industrialization began to alter the fabric of Swedish Society. Two primary family functions, work and education, were removed from the home and were formally institutionalized.Time for Sloyd work was minimized when the father went to work and the mother ran the farm and took care of the children. For those who had grown up close to the land, factory conditions were particularly dehumanizing. Morale among the workers plummeted, resulting in rampant alcoholism. Educational Sloyd in schools was invented as a means of countering the most destructive forces in Swedish society. It was based on the recognition that those who make, learn and grow through the process of making beautiful and useful things, thus become the foundation of a moral society and economy. Is it any wonder that with our modern American economy being what it is, Swedish sloyd and its impact on American education has been nearly erased from memory? Yesterday in the woodshop, I finished a ukulele, and nearly completed a fretted box guitar. Make, fix, create, and extend to others the joy of making that they may feel encouraged to learn likewise. An interesting blog post asks the question, "what if teachers refrained from laying out what the objective of a lesson might be? It has become a commonly held belief that teachers should clearly state their objectives regarding each lesson so that students would be better able to comply with what is expected of them. If the purpose of student participation in education is to get good grades, then knowing what the teacher expects sounds like a no-brainer, right? To make this work, teacher objectives are often written on the board for each lesson, but the blog post asks whether it might be better to simply leave the students in the dark. The post lays out three reasons why declining to state teachers objectives at the start of the lesson might be a good idea. The first is that laying out lesson objectives describes at the outset the teacher being in control of the outcome of each lesson. Secondly, communicating objectives robs the lesson of the sense of discovery that comes as students progress through learning. It's like telling the end of the story before turning the first page of the book. If the student is informed of what the outcome must be, is there really any reason to pay further attention? And third, laying out the objectives of the lesson in advance, keeps students from exploring tangential learning opportunities. For instance, "If this, then what about that?" "Sorry, this lesson is not intended to go in that direction." I add a fourth point. If you pay attention to the first principle of Educational Sloyd, that of starting with the interests of the child, you begin to understand that children actually have learning objectives of their own, that are too often squelched within the traditional school environment. Do teachers ever imagine that students would have learning objectives of their very own? Are they given that much credit? Can you imagine a school in which students are as interested and engaged as we would hope they might be, but in which they were expected to sublimate their own learning objectives to those their teachers dutifully write on the board each day, and without listening to what student interests might be? Good luck with that one. Quite sadly and in many cases, student interests are squelched and marginalized. I am reminded of one of my former students who had bounced like a basketball between Clear Spring School and the local public school. He told me, "I hate learning." What I knew to be true was that he had learned to hate being taught. Outside of school, he loved learning to cook, and was busy in after school hours producing claymation video. The problem that kept my student bouncing back and forth between schools was not in the student, but in the institutions that made little allowance for the fact that the student would naturally have learning objectives of his own that could be nourished and brought forth. Yesterday in the wood shop, I cut fret slots in a fret board, and inlaid small maple dots where normally required between certain frets. I am almost done with yet another box guitar. Today I will continue working in fulfillment of my own objectives. I woke up this morning with very little to say. I am putting strings on ukuleles. 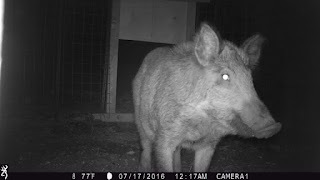 I checked the game cameras to see if hogs have been in or around the trap (no luck there). A friend has the following signature on his email. 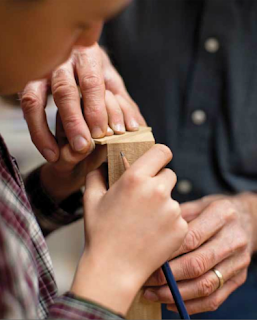 "If you want to become a better woodworker, do more of it." I began this blog in 2006 with the idea that in order to get people interested in hands-on learning, I could improve as a writer, and to do so, I should write everyday, whether I felt like it or not. And the same applies to anything that one chooses as a long term goal. It can be called the daily grind. It requires putting something first. Discipline is at the heart of all development. Applying oneself in steady effort, one begins to understand what things (steps, and ideas) are absolutely essential to the process or product, and what things can be safely stripped away. It's called "practice." And it separates the trivial and non-essential from crap. Have I said nearly enough for one day? Perhaps a picture is worth a thousand words. 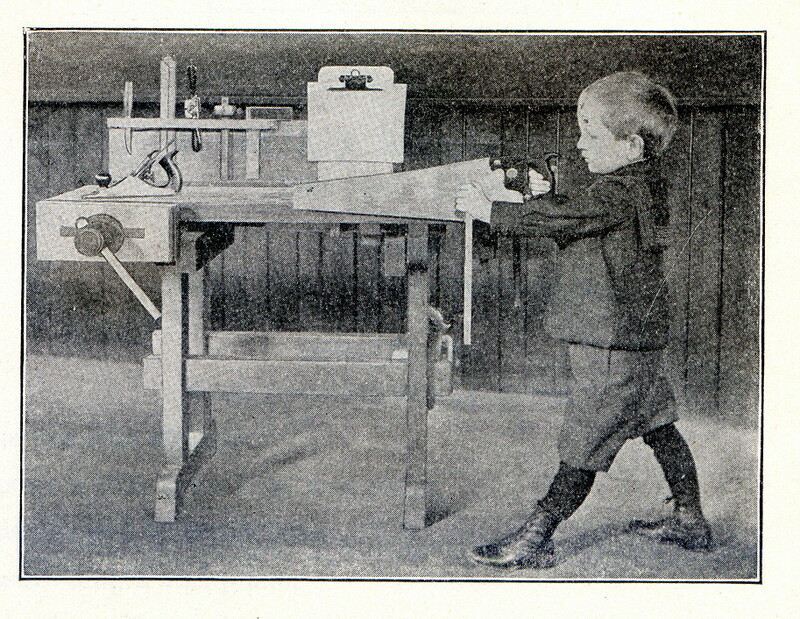 The image above is from Gustaf Larsson's book Educational Sloyd and Whittling. Make, fix, create, and increase the odds that others learn likewise. Today in the woodshop, I have guitars to assemble and finish. 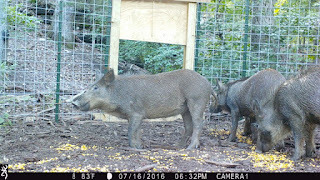 I also have an interview scheduled with a news reporter about our efforts to stop the hog invasion of Northwest Arkansas and the destruction of our forests that they cause. As are so many in our country, I am concerned about gun violence and the risk that our nation is being torn apart by racism and guns. They are each separate, serious issues, and put together, pose even greater danger. The National Rifle Association insists that no barriers be put in place having to do with the purchase of guns. Even those with mental diseases and terroristic intent are not to be denied their second amendment rights. But can we go a week without innocent black folks being pulled over and killed by cops? And if not, can we not see what comes next? The NRA insists on their rights to put guns willy-nilly in the hands of men and women who have been provided some justification for righteous indignation, and who may not have the psychological strengths to resist violence, and what happens next? And can we say we will do something about it? Train police officers to resist violence, and take guns out of the hands of those who should have never had access to them in the first place. 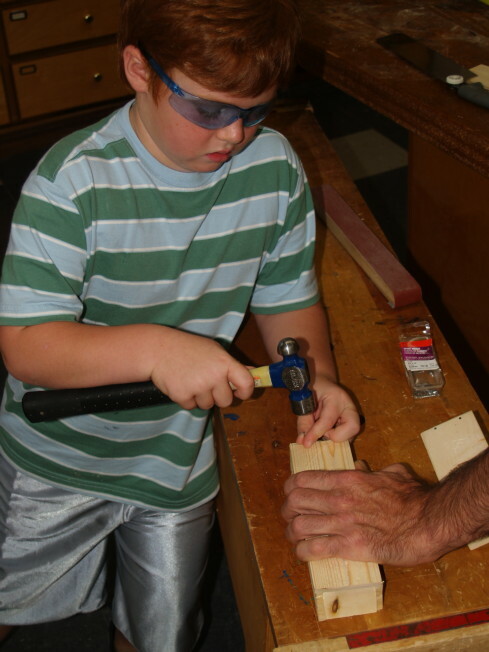 Put tools into hands so that children and adults are more creatively engaged, and they'll have less to be angry about. If the answer to some of society's problems is to put more power in people's hands, can we ask what kind of power do we want to put there? How about tools of creativity rather than the tools of destruction? Woodworking tools are tools of conviviality and peace. tiny people and keyed miter jig. I have begun turning tiny octagonal samples of wood into tiny persons to fill small wooden chapel styled boxes with collections of Ozark hardwoods. The project is intended to illustrate the wood worker's potential role as an interpreter of the natural forest. I am working on 4 of these boxes so have well over 100 pieces to turn. But if I turn for an hour a day, I'll be done in no time. I also left my keyed miter jig at MASW for use in next year's class, and quickly made a new one that I used to build a keyed mitered box for a box guitar. The jig is easy to make and easy to use. As you can see, it rides along the table saw fence, while carrying the box at a 45 degree angle. The results are shown below. Make, fix, create, and offer to others the likelihood of learning likewise. 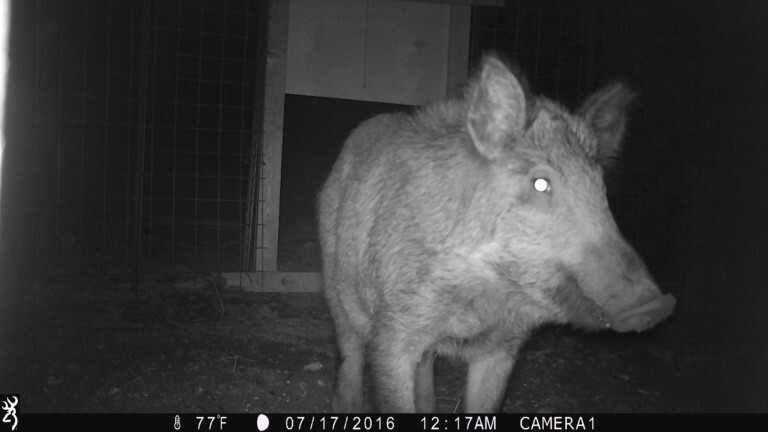 We have a game camera set up to watch the comings and goings of animals around the hog trap we set upon Monday. The trap is being kept open to observe and get the wary pigs comfortable to go inside. The trigger to release the door and trap the pigs inside will be set next week. The other animals to visit the trap were a raccoon, and several deer. As you can see, the hogs were wary to go inside the trap, and stood on the outside looking in. In the meantime, I spent part of the day yesterday splitting firewood for next season or the year after that, as it seems the mild winter of 2015-16 left most of my fireood prepared for last winter untouched. 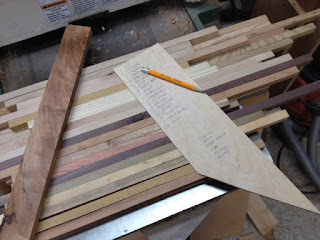 In the wood shop, I've cut small pieces of 28 different Ozark wood species, that I plan to turn on the lathe. As I've mentioned many times before, use of woods in woodworking is a way to become familiar with the trees that grow in our forests, and many woodworkers are also conservationists and advocates for preservation of the natural world that surrounds us. The woods are a window. Each species has a special role within the ecosystem, and each had special usefulness in human life before humanity fell so much in love with artificiality and ignorance of the natural world. Yesterday and the day before, I began cutting small samples of various woods to use in collector boxes I will call "Choirings of the trees." They are designed to resemble small chapels, and each will include a display of 28 small turned samples of our Ozark woods. Just combing through my shop and barn, I came up with 26 different species. Two others I got from friends, "Osage Orange" and beech, bringing the total in my possession to 28. I hope to have these small chapels of wood finished before September when I have a visit from members of the American Folk Art Museum in New York. And I hope to make a number more of these over the next few years for various museums if I can get any of them to take an open mind toward our American forests. The strips of wood in the photo above will be cut into small pieces and turned on the lathe to the general shape of tiny people. The wood on the jointer is Osage Orange, also called Bois D'Arc. It was the last sample to be acquired for my small collection. In about 1964, I was a sophomore in high school biology, and was surprised when my teacher announced to the whole class that I had scored in the 99th percentile on a standardized test on comprehension. I felt just a bit embarrassed at being called out in front of the class, and somewhat mystified that not a single question on the test had been covered in class. How could I have possibly gotten right answers for questions about which I knew so little? Of course part of the answer to that would be that most of the other people taking the test knew almost nothing either. That's how standardized tests tend to work. On the other hand, how else could my success be explained? First, it should be remembered that I'm the son of a Kindergarten teacher, and such teachers were at that time, interested in learning through play and were trained first and foremost in experiential learning. By the time I was in high school I had become a tinkerer and inventor, and made my own skateboards from laminated wood. I was an avid reader of Popular Science magazine and poured over each issue the day it arrived in the mail. In education, you can cover all the bases, and force feed students a regular diet of the materials stuffed into text books, and make them cover all of it and test them on it daily to the point that they rebel, and many do. By the time their senses have been dulled by boredom, they will have little interest in the subject, (or any subject) and little ability to discern or intuit right or wrong answers. Or, on the other hand, you can engage them experientially, asking them to do real things that are in sympathy with their own interests, and thereby challenge and encourage their intellectual growth. In the 1970s, University of Massachusetts psychologist Seymour Epstein, PhD, developed his "cognitive experiential self theory." In it, he points out that human beings process information through two systems: Just as we learn things consciously all the time--the cognitive part of the theory--we also learn things experientially, without realizing we've learned them. The point to note is that the kind of intellect intuition offers represents has two factors: being emotionally driven and activated by experience. In order for intuition to come into play, emotional engagement in the subject is a must, and some level of actual experience is required for its activation. Why is any of this important to a discussion of hands-on learning? It helps to explain why students going deep (hands-on) in the subjects of science, history, music, the arts, and wood shop, have an advantage in subject specific standardized testing over those who have been lectured to ad nauseum. We are actually smarter when we do real stuff and care about it. Surprisingly, that might come as a surprise to educational policy makers who seem to care only about test results and not about how children are damaged in the process. 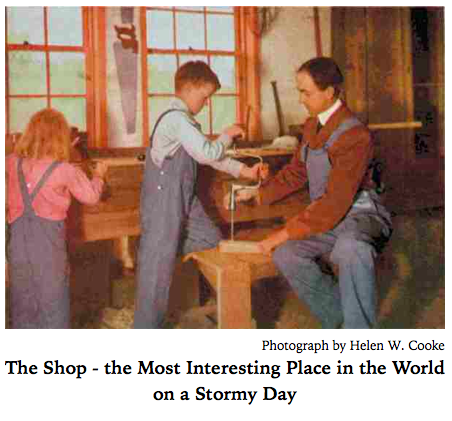 I have a brief article about teaching wood shop in the current issue of Wood Magazine. 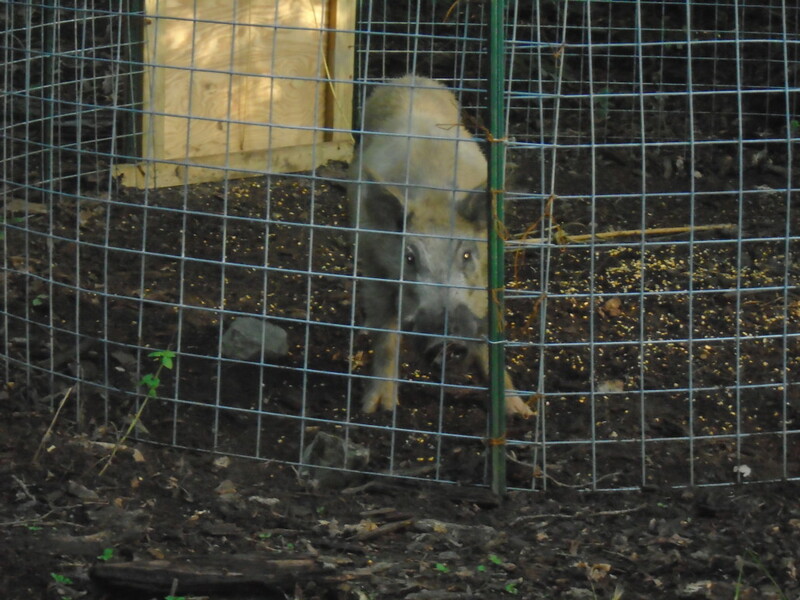 In the meantime, we've set up a hog trap on our property to begin the removal of feral pigs from our area. Wish us luck on this endeavor. The trap is shown above. Make, fix, create, and extend to others learning that comes likewise. Happy 4th of July. It's been raining here for days. University science faculty have frequently voiced concern that active learning is fine in principle, but it takes too much class time to allow for student discussion and reflection and that the approach does not allow for enough time to 'get through the material." In this study it is true that less time was available for "coverage" in the active learning section (Section A). Yet, the results revealed that students enrolled in the active learning section did as well or better than the students in the traditional lecture sections on a majority of the shared test items, and that the performance of students in the active learning section improved significantly across the semester. The results suggest that the principle of parsimony, "less is more," implicit in the National Science Education Standards (National Research Council, 1996) for K-12 students is also appropriate for large lecture introductory science courses at the post-secondary level. Lecturing has been the predominant mode of instruction since universities were founded in Western Europe over 900 years ago. Although theories of learning that emphasize the need for students to construct their own understanding have challenged the theoretical underpinnings of the traditional, instructor-focused, “teaching by telling” approach, to date there has been no quantitative analysis of how constructivist versus exposition-centered methods impact student performance in undergraduate courses across the science, technology, engineering, and mathematics (STEM) disciplines. In the STEM classroom, should we ask or should we tell? A staggering 55% increase in failure rates in lecture based classes is a remarkable statistic, but not surprising to those who routinely endure the boredom of lecture classes. What we learn hands-on is learned at greater depth and to greater lasting effect. Over the next few days, I hope to offer an explanation of why and how that's true. And to fix things, we will have to remove education from the hands of educational policy makers who fail to understand the essential role the hands play in learning. Yesterday in the woodshop, I began making ukulele style bridges to fit box guitars. The process is interesting and effective, helping me to understand how the Chinese can make these to sell on eBay for about $2.00 each. I've made these in cocobolo and persimmon. An article by June E. Eyestone published in Studies in Art Education, Fall 1992 noted that arts educators were almost completely oblivious to the impact of Educational Sloyd. Why that would be so was left as a question mark and an invitation to further research. Her article, The Influence of Swedish Sloyd and Its Interpreters on American Art Education did a good job of explaining the origins of Sloyd and its values. Reasons for why something or someone so pervasive or powerful is barely mentioned in the literature would be a revealing and critical endeavor for future research, especially in light of multicultural issues. 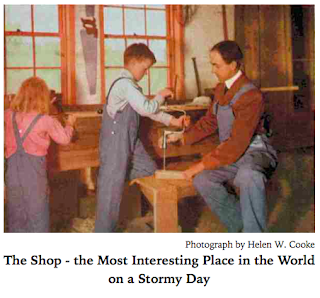 If you look to the column at right you can find links to the various resources I've had published in various magazines and journals on the subject of woodworking education. Or you can follow this link: to Doug Stowe's published works. In the meantime, and despite my own efforts to awaken educators to the history of manual arts training and its original purpose and why it might still be important today, even among some arts educators, there is a failure to grasp the relationship between the use of the hands and the development of intellect. It is worth while to spend a few minutes in examining three of the bonds which bind the two subjects together, for art and handwork were brothers long before they began to go to school, knit by ties more close and vital than the twins of Siam. There may be a mis-perception among artists and arts educators that their work may contain and represent greater intellect than craft work and most particularly when it comes to the manual arts. This morning I hauled three post oak logs to the mill and in addition, ordered a 12/4 x 8 in. 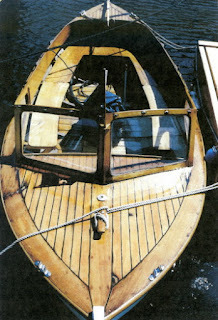 keel for a boat I intend to build in the barn. Wish me luck. This has been in planning stage for months, but when I delivered the logs to the mill, the mill owner looked at me like he'd seen it all before. In fact, he was a neighbor of an old friend of mine that carried the nickname, Plumb Bob. Bob had built a few boats between bouts with the bottle, and was overall, a fine person to know. But that was nearly 35 years ago, and both the mill owner and I were pleased to be reminded of an old friend. The mill operator cleared up a rumor I had heard that Bob's death was the result of a gunshot wound when he had been accidentally shot by a friend. While the gunshot incident was real, it was not the cause of death. Crossties, fence posts, and for furniture and other purposes along with others of the white oak class. In reference to white oak, Quercus Alba, the book mentions shipbuilding as one of its many uses. In any case, the plans call for white oak, it's white oak I've got (as post and white are sold and used interchangeably), and with white oak, my small vessel will last a very long time. I spent nearly the whole day yesterday at my desk, organizing photos for my book on box guitars, writing the first two chapters, and sending them off for my editors to review. It felt good to have this first work go out in time to meet my deadlines, but felt damaging to have spent that much of my time at my desk. We are not really intended for such. Even starting the day with a workout at the gym is not enough to overcome the hazards of a sedentary life. Last Saturday at Marc Adams School as Marc was making introductory remarks to my class, I sat down in a chair among my students and realized that was the first time I had sat down during my whole time at school, when I was not either at lunch or in my hotel room at night. That, my friends, is what life should be like, even at my age. And while there are those who would prefer to live in a vegetative state, with only the mind at work, I would suggest the healthful effects of an active life. If you have access to an oak forest then you are very lucky indeed. In many cultures the oak forest has an almost mystical position, and oak is beyond question the tree that has played the most significant role in the development of Western civilization... by splitting up a rough, crooked oak in the right way, carpenters were able to obtain a wide variety of different shapes and building materials of great strength. The ship's knee in the photo above shows a traditional use of oak, and it's reuse in constructing the old town of Bergen, Norway. Bergen was a trading port in the Hanseatic League. 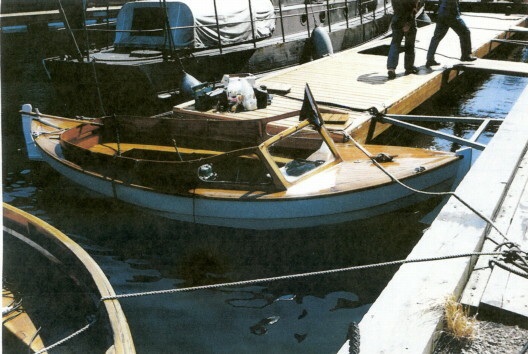 The oak shown may have come from anyplace in the world and was probably recycled from a ship or from excess inventory of materials used for ship repair. In my own case, I have three white oak logs that are perfectly straight that I intend for planking which must be straight. So today, being lucky indeed, I will use the tractor and load the logs and transport them to the mill with instructions that they be milled just so. The centers of the logs will be cut through and through at 8/4 and the rest of the remaining wood will be cut at 3/4 so 5/8 in. thick planking will result.